I have finally finished my Baby Cashmerino Heartland Shawl! It took 5 skeins of blue -gray Debbie Bliss baby cashmerino bought at Webs’ Tent Sale last May. Since I intended to use the shawl to keep me warm from the cold with its softness, I knit it on smaller needles to make a thicker fabric. Further, I planned to leave the shawl unblocked to maximize the thickness of the fabric. As often happens when one knits, the project evolved as I was working on it. 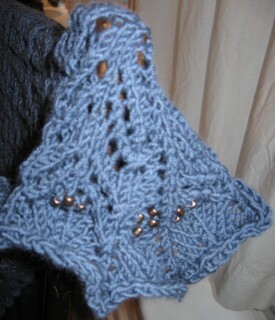 I decided to add some copper colored beads to enhance the allure of the shawl. Since I was concerned about the beads conducting cold and /or getting broken with lots of use, I limited my beading to small clusters of four beads in a diamond shape. I used most of the five skeins of Debbie Bliss Cashmerino and made five repeats of the main pattern. I had part of a skein left but it wouldn’t have been sufficient to make another repeat. Here are my feelings about the Heartland Shawl for those of you deciding whether or not to make one. The Heartland Shawl pattern is free. For some, that might be sufficient reason but I must admit that I’ve found that many free patterns lack testing which is especially important for lace! Evelyn Clark’s lace patterns are a dream to make. They are well written and charted with detailed instructions regardless of which you like to follow. The border pattern is well matched to the body of the shawl. 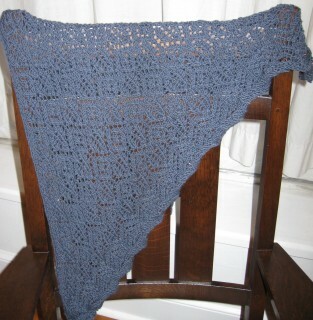 The pattern can easily be adjusted to make a larger shawl and it looks good in thicker yarns. There are double decreases which cross repeats in two rows. For those of you who use stitch markers to delineate repeats, this means that you have to move the markers across the row for these rows which can be a pain. Good luck with your Heartland Shawl! For more on the Heartland Shawl, click here.